HRANA -The Center of Statistics at Human Rights Activists in Iran (HRAI) has published a report regarding the recent seven days of protests in Iran which occurred from December 28, 2017 to January 03, 2018. Currently, we have reports on the extent of the protests and the names of arrested individuals as of January 09, 2018. 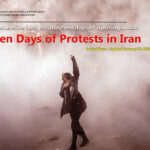 HRANA – The Center of Statistics at Human Rights Activists in Iran (HRAI) has published this report regarding the recent seven days of protests in Iran which occurred from December 28, 2017 to January 3, 2018.